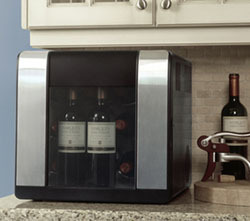 This compact Single Zone wine cellar easily fits onto most counter tops and makes an elegant yet functional statement. The pre-set temperatures make for easy set and forget operation, perfect for anyone to use. Now the perfect way to store 12 bottles (9+3) without taking up a lot of space! 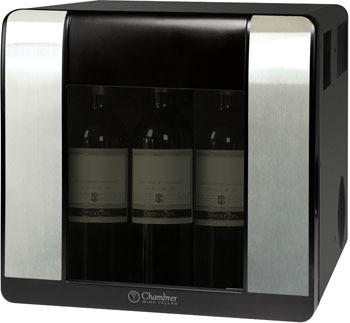 Store nine bottles horizontally and three open or closed bottles standing up. Unique door design: See-thru display and Hidden control panel. 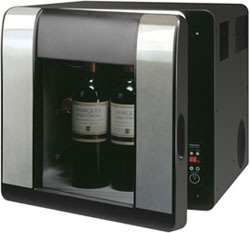 Built-in Micro-processor control allow for simple set and forget operations. Pre-programmed touch pad control with eight unique settings. Celsius (°C) or Fahrenheit (°F) Temperature Display. The internal temperature can be set between 7°C & 20°C (45°F~68°F).